Sorry I haven't been on much with work and school and whatnot. I got a new AIM. I'm not sure if I told you. Message it anytime. I'm always signed in whether I am at my computer or not. An sometimes I forget to put up away messages. Well, a lot of times actually. So what have you been up to as of late? Oh here and there. Moving. Not being allowed to access the internet. But I'm back! Do you have my new AIM? Hello. How are you? Long time no talkie. 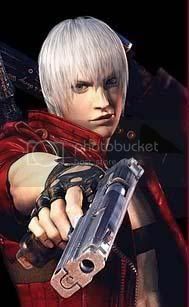 Dante: Remember what we used to say?